A KNOCKOUT 1950 Franklin that looks like a later PF 67 Cameo! 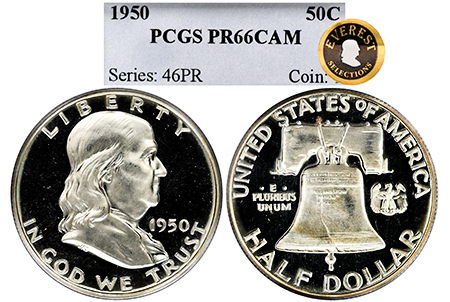 This phenomenal, problem-free ’50 ranks among the finer examples known for the date, offering cameo contrast and eye-appeal rarely encountered anymore, as collectors have been salting these PQ (Premium Quality) pieces away ONE by ONE! This specimen most definitely ranks among the examples that should be acquired and enjoyed for many, many years. PCGS has only graded 62 examples to date in PR 66 Cameo, and this one boasts perfect, deep, pitch-black mirrors matched with fully frosted, snow-white devices. It is one of the finest 1950 Franklin Cameos out there!